Physical description: Adult height is about 3’8” to 4’3” and length is about 5’8” to 8’3”. Females 462-557 lbs and males weigh 528-891 lbs. Life span up to 19 years in observation. The bongo inhabits lowland forests in most of its range from 2000 to 3000 meters. Male bongos are little bit larger than the female in size. They are largely active at night, were extremely shy and therefore difficult to see. They are quite rare due to being hunted for their horns. Doesn't like to live in a group. Mostly found in a pair. It has a short hair vertical mane from the shoulder to the rump and a long tufted tail. 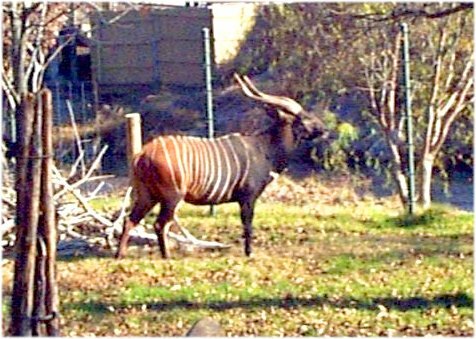 Generally female bongo has brighter colored and old males may become much darker. It depends more in its sense of hearing than on sight or smell. Older animals are often much worn and frayed from the friction of moving through heavy undergrowth. The bongo prefers to go under or around obstacles rather than jump over them. It likes to wallow in mud puddles and then rub the mud against a tree and polish its horns. Since they are in great threat of being killed, they are only active at night. Their skin color are also helps them to be invisible from the far. It runs gracefully, and at the full speed through even the thickest tangles of lianas, laying its heavy spiraled horns on its back so that the brush cannot impede its flight. Comments about the bongos of the Fort Worth Zoo. 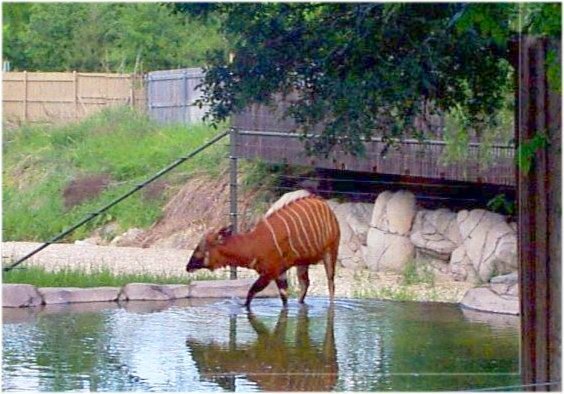 There is a pair of bongo in the Forth Worth Zoo. They are well taken care of and seem healthy. They are given a special place to live. Zoo had made a small pond like water source for them at their place. It might seem hard to believe that but when I watch the bongo for a quite bit of time, I started to wonder how hard it is for bongo to live in the wild. It is the biggest in its antelope and that makes it more visible to the predator and its hunter. It seems shy, it doesn't interact with other thing that it doesn't know about.